Dustin Pedroia activated off the injured list. Lin was optioned to make room for Pedroia. 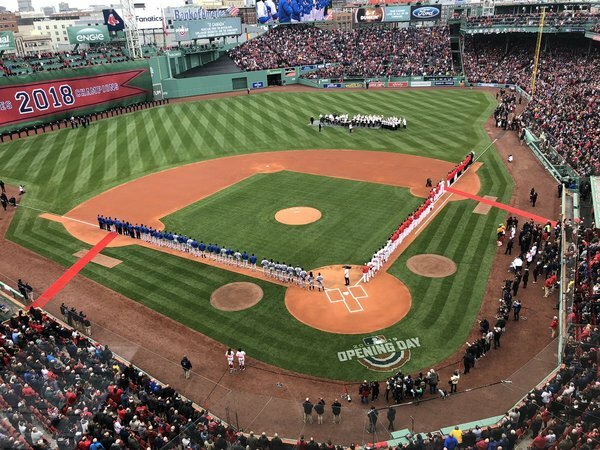 #RedSox return home: Benintendi LF, Betts RF, Moreland 1B, Martinez DH, Bogaerts SS, Devers 3B, Pedroia 2B, Bradley Jr. CF, Vázquez C, and Sale LHP. Alex Cora revealed that Chris Sale was sick before his last start and didn’t get a lot of work prior. That contributed to the velocity drop ... Brian Johnson’s elbow injury will not end his season, as was feared. But no timetable on a return. Cora says Chris Sale’s diminished velo in his prior start was largely a product of a stomach bug he had entering that outing. Sale hadn’t been able to throw on the side between his first and second starts. Sale had a normal bullpen session in Arizona on Saturday. Clay Buchholz will start for the Jays on Saturday. Coming off the IL. 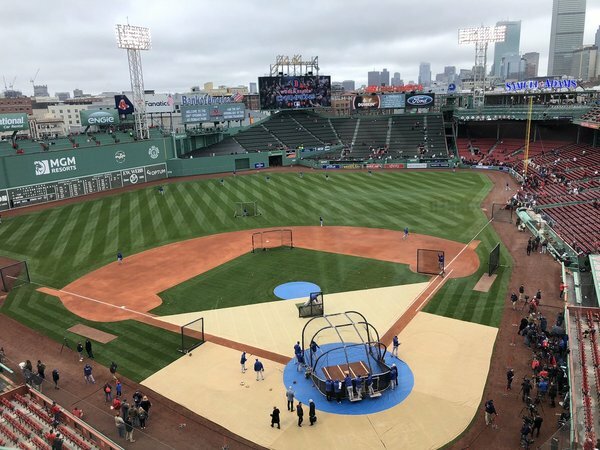 Will join the team at Fenway today. Thanks to our friends from the Toronto BBWAA. Toronto is short two players today. Luke Maine and Justin Smoak both have neck issues, manager Charlie Montoyo said. 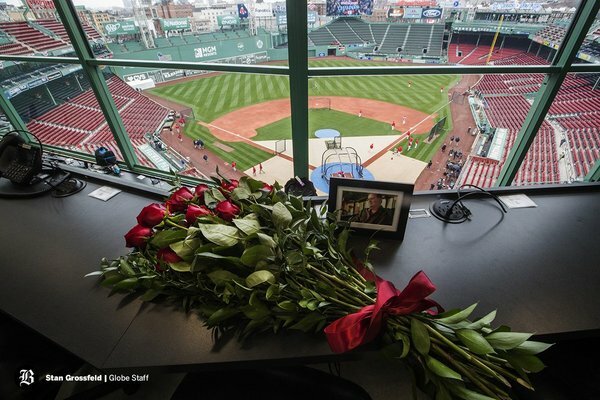 Opposing teams will be pleased to learn the visitor's clubhouse at Fenway Park has been remodeled. New trainer's room, new room for the coaches, new TVs, etc. 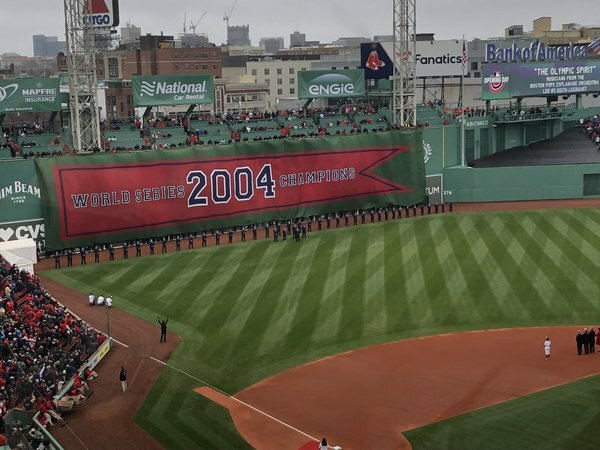 Schilling and Manny Ramirez among those in the procession of past Red Sox World Series winners. Ortiz going with the one-handed carry of the 2013 trophy is ... one of a kind. Manny and Curt Schilling among the former champions on hand. Also Pedro, Ortiz, Wakefield, Lowell, Timlin, Foulke, Napoli, Middlebrooks, and more. Cora gets the first 2018 ring. David Price the first player to receive a 2018 ring. David Price the first player out of the dugout. Big cheers from the crowd. Noticeably loud cheers for Nate Eovaldi. Blue Jays taking it all in from their dugout. Pedroia is getting hugs from the past Sox champions. Ortiz lifted him up with a giant bear hug. Mookie Betts hugged all the owners just for future reference. 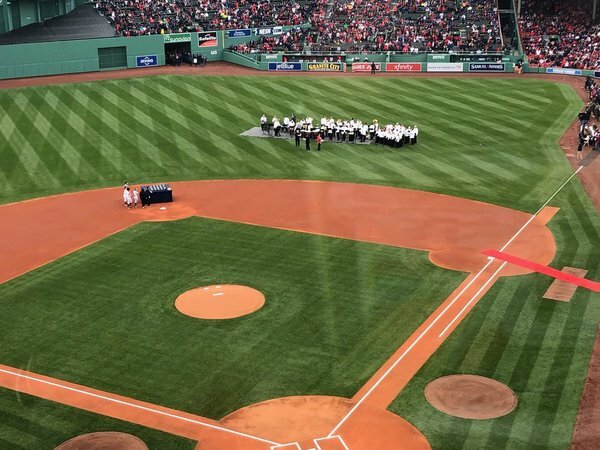 Mookie Betts gets the final player ring. Players now go to CF to raise the WS banner. Cora is raising the flag in CF. There were a couple technical difficulties - tangled rope - to start (metaphor for start of 2019?) but it’s now up, with all the Red Sox player gazing up at it before wading back in. 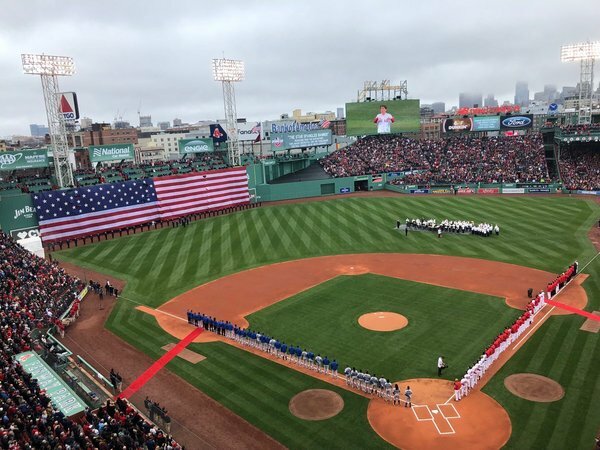 Red Sox getting their money's worth out of the Boston Pops Esplanade Orchestra. They've been playing about 25 minutes. Today is the first game in MLB history with two Puerto Rican managers. Charlie Montoyo pointed at Alex Cora as he came out of the Toronto dugout. Nice moment for a lot of baseball fans on the island. 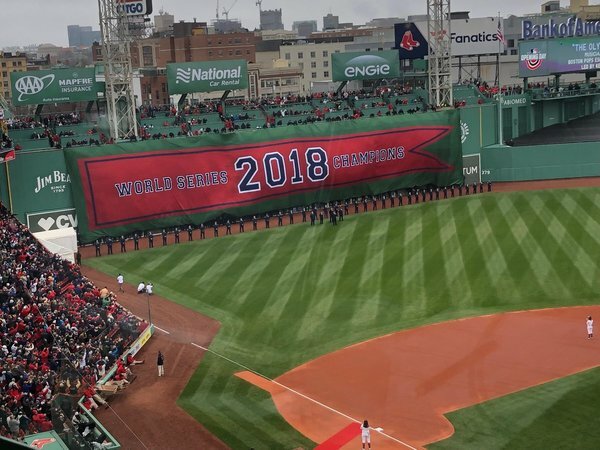 World Series banner going up. 10 championship trophies on the field from two teams in one region, all from this century. That’s insane. Gronk, Edelman, Gilmore, Chung, Harmon, J. McCourty among the Patriots on hand.